Description: Board & Brew's location in San Clemente is not to be missed. Our focus remains on our specialty sandwiches and craft beer. For decades, fans of our sandwiches have spread the word across Southern California because they love our simple, straightforward menu and consistent everyday value. Busy But Delicious - Especially the Gluten Free Wrap! We ate here twice on our last visit (we come out once a month for work) and had a great sandwich/wrap both times. Order ahead online to save on time, especially if you're coming during the lunch rush. We'll definitely be back! So stoked to hear how much you always enjoy visiting us when you're in the area, Allison! We'll be glad to fix you another sandwich or wrap any time you have a craving in the future. Take care till next time! They have lots of different sandwiches on thei menu. Kiddo friendly and fast service. Also has take out service. 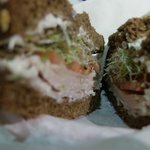 GREAT SANDWICHES and it seems to be a local favorite! You know when you pull up and the place is packed it's gonna be good. My husband and I took a day trip to Carlsbad and arrived at lunch time so I checked out Yelp reviews for the area. Board & Brew sounded like the food we wanted and the reviews were good. We were not disappointed. The girl at the counter was great! I asked her what the favorites were and she took her time describing each fav. I had the Turkado and my hubby had the Baja Chicken. The Turkado is a turkey avocado on soft sourdough with really great quality fixings (and I just love shredded lettuce on my sandwiches) and was DE-Licious!! My husband loved his spicy chicken sandwich too. We both thought our sandwich was better. LOL! It came with their "special sauce" but we didn't use it cuz it didn't need anything added. We didn't try the local brews but next time we stay the night we will! Oh, and they bring the food to your table and clean up for you too!! We will defiantly be back! So glad to hear how much you both loved your sandwiches! It's always tough picking a favorite around here, but the Turkado and the spicy chicken are both high on the list for me. Can't wait to welcome you back for more sandwiches and a round of brews again next time you're in the area. Take care till then! Love when I come to town and can get a Board and Brew sandwich! Service is great and sandwiches actually have lots of meat!!! Glad we're always a great treat when you're in town, Allison! We can't wait to welcome you back for another sandwich soon. Take care till then! Visiting family who live here and they took us here for sandwiches. The Veggie supreme w Turkey was delicious. We enjoyed everything ! Especially the secret sauce .You know it's great when lots of people are there. Sandwiches are huge! So glad you got the chance to visit us when you were here! We're looking forward to your next trip already and the chance to introduce you to even more of our sandwiches -- you can never go wrong with the Turkado! Been to Board and Brew? Share your experiences!